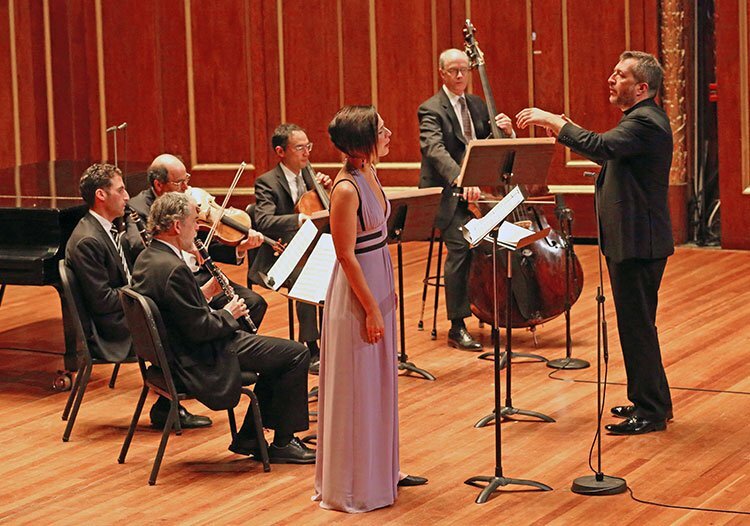 Visiting star composer-pianist-conductor Thomas Adès put on a bold show of musical versatility Sunday afternoon at Jordan Hall, joining the Boston Symphony Chamber Players in selections ranging from Purcell to Stravinsky. A true heavyweight (physically, he resembles a prizefighter) in all three disciplines, Adès constructed a program with links to Shakespeare, including a highlight of the concert, his own Court Studies from The Tempest, extracted from his popular 2003 opera The Tempest based on the Shakespeare play. The ensemble of clarinet, violin, cello and Adès on piano gave the work an eerie beauty, most movingly in the sixth verse, “The King’s Grief”, which gradually swelled in a series of lush chords, ever quieter, until the barely audible final violin phrase. The audience roared its approval. Management was spotlighting the muti-tasker in the new role created expressly for him: Artistic Partner of the BSO. Boston and Tanglewood will get to know Adès well in the coming three years of his commitment, with dates already set for his conducting, piano accompaniment and ensemble performances. Benjamin Britten’s Sinfonietta, a rarely heard composition dating from 1932, Britten’s student days at London’s Royal College of Music began the event. The melodic character, sometimes tempered with a dash of atonality, prefigures Britten’s later originality as he made his segue into his more lasting achievements in opera and other vocal forms. It displays his early command of instrumentation and his taste for fresh harmonies, pleasing melody and wry humor. Players in the Sinfonietta under the Adès baton were Elizabeth Rowe, flute; John Ferrillo, oboe; William R. Hudgins, clarinet, Richard Svoboda, bassoon; James Sommerville, horn; Malcolm Lowe and Haldan Martinson, violins; Steven Ansell, viola; Adam Esbensen, cello; and Edwin Barker, double bass. In other pieces of the concert, players rotated as needed. The concert moved into a charming series of light songs that carried on with the Shakespeare theme. First came mezzo-soprano Kelly O’Connor in the Brahms Ophelia Songs, a series of five of about one-minute-each; Adès and chamber players accompanied her. The words come from Hamlet, Act IV, scene V, which O’Connor sang smoothly in the composer’s German. Adès then joined O’Connor in his own arrangement of Henry Purcell, Two Songs from The Tempest. The provenance of the opera is contested by various scholars including the Purcell Society. But Adès made it his own in this arrangement that somehow manages to sound both modern and baroque. Again, O’Connor and Adès proved natural partners. Following intermission came the major work of the afternoon, Franz Schubert’s Quintet in A for piano, viola, cello and double bass, D.667, “The Trout”. The theme most frequently attributed to the piece occurs in the fourth movement, andantino-allegretto. With Adès on piano again, this passage was his most memorable virtuoso display. The scorching tempo for the variations in octaves flowed easily from Adès’s fingers, and the four strings raced to keep pace. Even Edwin Barker on double bass, took a virtuosic turn. I had never heard before heard the Trout played quite at this level of perfection. The individuals matched to an incredible degree; at end of each movement all bows flew up in perfect sync.